Halloween is a fun time of the year for kids and grown-ups. Costumes, decorations, parties! Candy and treats play a big part in the Halloween festivities, but the average serving of Halloween candy provides around 250 calories, but hardly anything else. Remember, your kids will get plenty of candy from trick-or-treating. Make the rest of Halloween as healthy as possible! 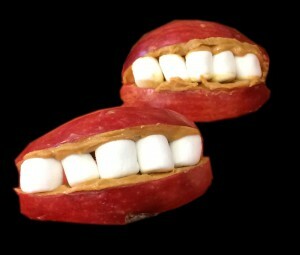 Here are some fun and creative ways to provide healthier snacks for your kids this year that provide better nutrition than anything found in their trick-or-treat bag! 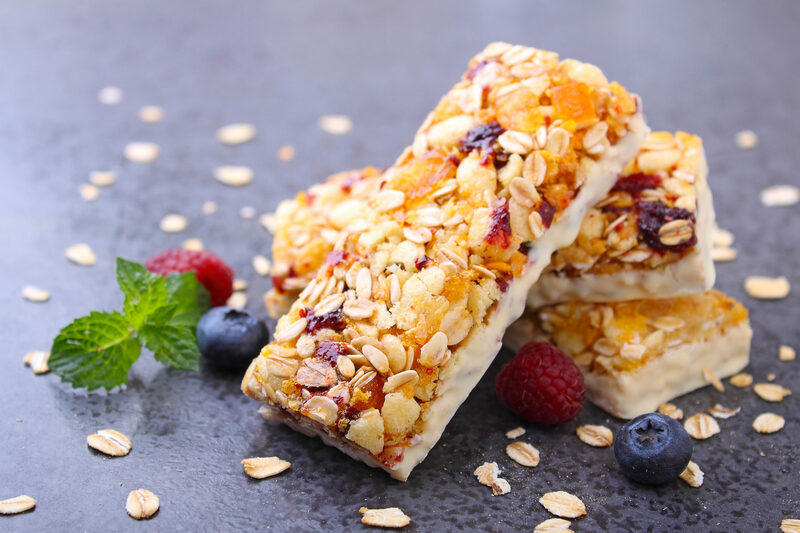 This healthy treat is something that the kids can help create and will have fun with. Cut apples into slices and spread peanut butter on one side. Next, line a slice with miniature marsh mellows. Top with another apple slice. 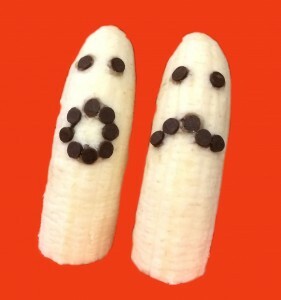 Simply slice bananas in half and make spooky faces with chocolate chips. To really draw attention, stand the ghosts up on a serving platter. 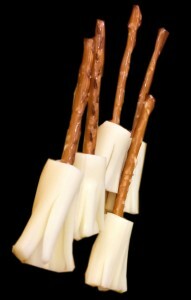 Simply cut mozzarella sticks in half, insert a pretzel stick into one side, and shred the other end so that it looks like a broom. Kids can make this fun treat all by themselves! Simply strand three raisins each onto eight strands of uncooked spaghetti. 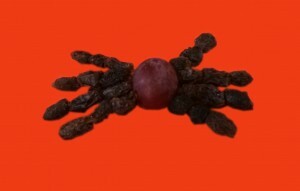 Attach the legs to the grape and you have a spider! The spaghetti will begin to soften after about an hour, but this is safer than using toothpicks to make the spider legs. 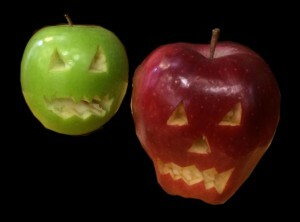 For a fun treat, use a paring knife to carve faces into apples. Apple jack-o-lanterns can be made ahead of time, just brush some lemon juice onto the exposed area of the apple’s flesh to keep it from turning brown. 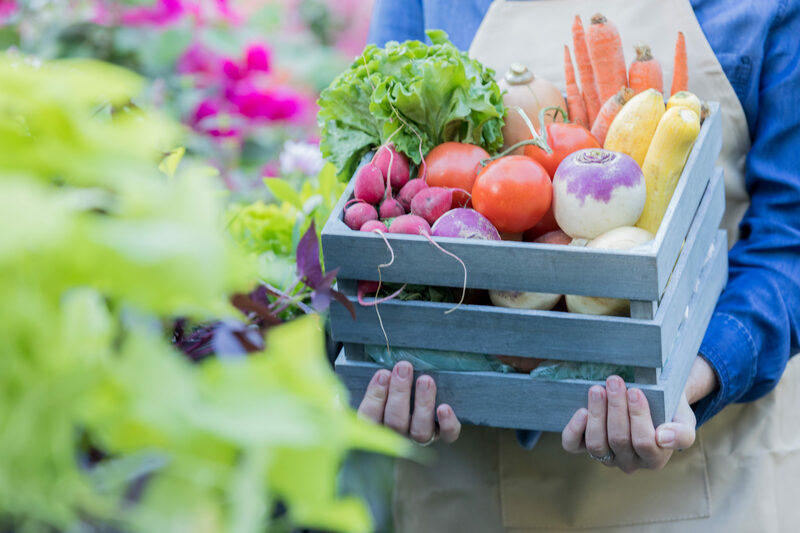 This is a great way to show your kids that healthy food can be fun too! Really? When did being a kid stop being fun? We had candy for Halloween growing up and my parents rationed what we could have per day; it was a treat. And we weren't overweight. I'm sorry, I would not have cared for these treats as a kid...where's the candy??! !